Livingstone (Zambia) – Novemver 24, 2017 (travelindex.com) – Alain St.Ange, the Head of Saint Ange Consultancy with its weekly Saint Ange Tourism Report was in Livingstone, Zambia this week as the consultant for the PMAESA (the Ports Body for Southern & Eastern Africa) to bring forth the importance of Cruise Africa for the Continent. Also present was H.E. Auguste Ngomo, the AU Regional Delegate for Southern Africa, SADC and COMESA. The meeting as could be expected touched on the African Union’s supposed request to Seychelles for St.Ange to be removed as a Candidate for the UNWTO elections for the position of Secretary General and the threat of sanction that this request entailed. Alain St.Ange is the former Seychelles Minister of Tourism, Civil Aviation, Ports & Marine and before that the island’s Minister for Tourism and Culture. He was First President of the Indian Ocean Vanilla Islands and was also the former Seychelles Candidate for the position of Secretary-General of the UNWTO. He is today the President of the Seychelles Labor Union, Deputy Secretary General of FORSEAA (Forum of Small Medium Economic AFRICA ASEAN) based in Jakarta Indonesia, listed as a Consultant for TMN (Travel Marketing Network) in New York USA, Co-Chair of the SUNx (Strong Universal Network) Organisation in London UK, Vice President & Founding Member of ICTP (International Coalition of Tourism Partners), Consultant to PMAESA (Port Management Association of Eastern and Southern Africa) based in Mombassa Kenya, CIOA (Cruise Indian Ocean Association) based in Durban South Africa and for Cruise Africa. 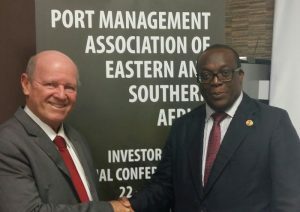 After the meeting in Livingstone Alain St.Ange said:- “I am happy to report that we discussed the past, the present and the future of our region and its AU Organisation’s possible involvement. The AU is and should be the organisation that rallies us and cannot ever be the body that goes against all what our forefathers fought to break. Respect and sovereignty must be guiding principles that are sacred for the Continent’s grouping to ensure we are and remain proud”. “We also discussed the need to the AU to be more involved in tourism as a vital industry for the African Continent” St.Ange said in ending.